Having started Aria Property Group 15 years ago, Founder and Managing Director, Tim Forrester, has created some of Brisbane’s leading residential and lifestyle developments. Today, Tim touches on the process of developing these iconic projects, as well as discussing the impact of development on the Brisbane property market. Welcome to the Brisbane Real Estate Podcast where, each, week we'll be answering all of your questions relating to the local property market, with CEO of Place Estate Agents, Damian Hackett. Be the first to get market insights, trends and tips on everything you need to know when it comes to Brisbane real estate. To download a copy of our free Brisbane Property Report, head to eplace.com.au/podcast. Welcome to the Brisbane Real Estate Podcast. 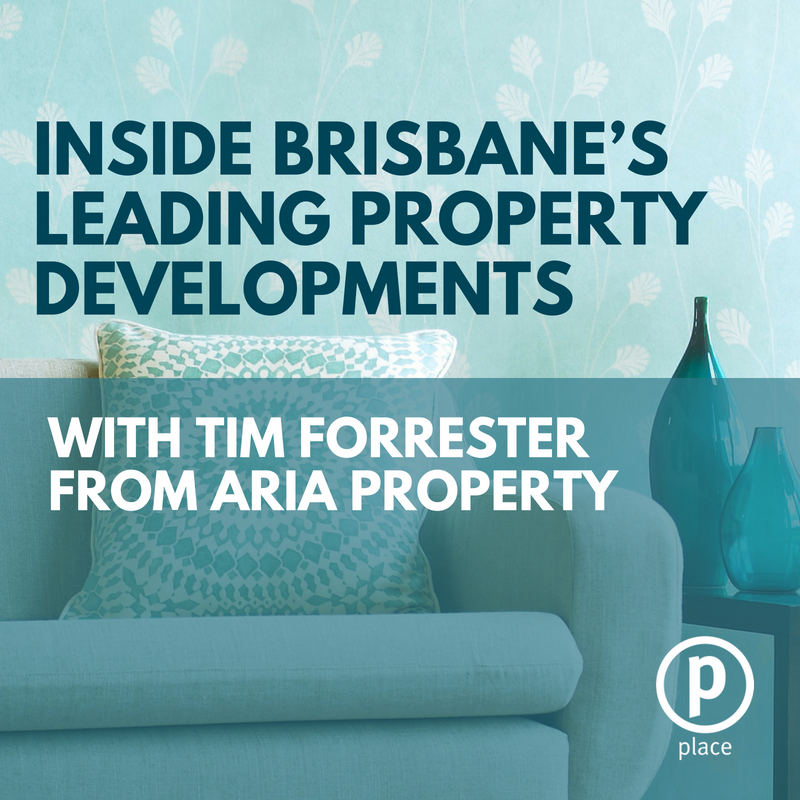 In this episode, we're talking to Tim Forrester, managing director of Aria Property Group. Welcome, Tim. Thank you Damian, great to be here. So Tim, it's now been 15 years since you've started Aria. It's been a huge journey if you look at what's been happening in the last few years particularly, it's quite a nice success which obviously you must be very pleased about. What is your vision with Aria? Look, I think with Aria, we've really taken a bit of a different approach. It's about creating these iconic projects architecturally, but also precinct wide, we think like we've done our pitch line. It's about creating iconic projects that we're really proud of and proud to walk our families past in twenty, thirty years time. That's the general driver of every single decision that happens with Aria property group. Yeah. [inaudible 00:01:34] I mean, you've got to get there. But that's a great example that I see, where if you look at some of the urban renewal areas that have happened, say Bulimba and say Newstead, you've got a number of developments that have come together and created an amenity that competes with each other. Whereas, I guess the opportunity you've had Fish Lane because you've created a precinct, I guess to be able to control that. How important was that? Yeah, I think having that complete control over an area really enabled us to master plan the precinct and get the right users that really compliment each other and not cannibalize each other. So it's about having that holistic approach to it. And we wanted Fish Lane to be more than just you know, a great dining precinct and café precinct, we wanted Fish Lane to all be about the arts and the culture. So obviously you've got the Gallery of Modern Art and the Art Gallery on the doorstep of Fish Lane. So we wanted Fish Lane to be an extension of the Art Gallery and actually be a sort of curated, outdoor street art gallery, I guess. We've put 35 pieces of street art down the lane way. We've obviously put the [inaudible 00:02:46] and road treatment, we've put the contemporary lighting and now we're starting to roll out a series of sculptures. So we want the lane to be something that's evolving and changing and constantly, you know, a reason for people to visit Fish Lane other than just having a great meal at any one of the restaurants. Parked cars and ... Parked cars and rubbish bins. Yeah, look we've still got a few more, a few more projects to roll out and I think the next step for Fish Lane is really the fine grain of Fish Lane and that's where we wanna start to get more and more different street art and galleries and just things popping up. We're actually working on a gallery trail down Fish Lane at the moment where we're gonna have six or seven sort of, indoor gallery spaces. So when you're looking for art for your house or if you just wanna go and explore some galleries, we want people to think, "Fish Lane's the precinct to go. South Brisbane's the area to go. ", and not only explore the street art on the side of the buildings, but also duck into these beautiful little art galleries, which I know is something Brisbane City Council have really been wanting to bring to Brisbane. Tim, I think back to the 80's, when I guess I was first aware of the property in Brisbane and the biggest change, I've said it before, that I've seen over through time has been the evolution of the apartment market. Back then, a lot of the apartments were being built with you know, two bedroom walk ups, six packs by the Italian builders, but if you look at, say [inaudible 00:04:29] it's a one stop shop, it's a listing. What's, I guess a strategy that you've adopted there. Yeah, I think for us with Aria over the last 15 years, we've seen the drivers of what our owners and tenants have been wanting and it has been very focused around lifestyle, has been the key thing. So that's where they want to move city to have the lifestyle convenience of not only the requirement not to commute and have to sit in traffic, they can walk to work, but to have the cafes and restaurants and bars on their doorstep. [crosstalk 00:05:03] you've internalized the lifestyle with the building itself. Yeah, so I guess the Aria DNA is we retain 100% ownership of all of our ground floor retail and then we go out and we partner with what we believe to be the best restaurateurs in Australia. So we bring that lifestyle to your front door. So you think that 6 o'clock in the morning, you walk down in your lift, you hope in your lift, you get the ground floor and you can get a cup of coffee at 6 o'clock and a fresh baked croissant on your front door as you walk out to work. You come home at night and you can have a beautiful meal and a glass of wine or some tapas and meet friends and have that genuine lifestyle not a kilometer away, not driving distance away, but literally on the front door of your apartment. [inaudible 00:05:51] have gone beyond that with, I guess the Aria living. And that experience there where I guess, I'm previously used to the mainstream lights with the building, I used to pass all the other people. But they even put that back in and created another level of experience with the [inaudible 00:06:05]. Can you run us through that? Yeah, so I guess Aria living is our in house property management and building management that we go. So again, not only keeping the retail, but keeping the management rights has enabled us to ensure that these buildings get better over the next 10, 20, 30 years. So it's not just about cleanliness and those basic property management things, it's about bringing a lifestyle to our owners and to our tenants within our building. So at Aria living we put on complimentary personal training every week for people. We put on complimentary yoga. We have umbrellas in the lobby if it's raining. We have fresh apples every day. We have newspapers every day. You know, we can manage things lie dry cleaning and car washing and all these basic things that people want from a convenience and from a lifestyle point of view. And the biggest thing we want in Aria buildings is to bring back that sense of community in an Aria building. And it's something that you have in your residential street. I think growing up in a cul de sac where you used to play cricket in the street and go and get some milk for your neighbor, that's really been back in an apartment living, where people don't know each other, and as a result they don't feel a sense of community and safety. So in an Aria building, by doing the wine and cheese nights and the personal training and all of that, whatever interest you're into, you get to meet people, like minded people within the building. So you get to meet friends and you get ... You might make a new relationship. Whatever it is, it's really building that sense of achievement, something we're really proud of. We've had, I think we're up to three proposals, we've had two engagement parties, we've had a couple of weddings on our rooftops now. So again, you start to see this holy ghost system of where people are falling in love in the buildings, this is a really thing. So I guess it's also taking a root from, say a five star hotel. It's bringing the Ritz Carlton, W hotels, sort of five, six star hotel experience into a long term residential and if you look at every Aria apartment, we actually outlaw Airbnb in short term accommodation because that's not something we ever want in an Aria building. We want our buildings to be genuine and long term rentals and owner occupied people living within our apartments. I've looked at the last couple of developments you've done and the rooftop really takes it to the next level. What's your thoughts? Yeah, I guess that was sort of that third pillar around the lifestyle, you know ... It's the restaurants on the ground, it's the Aria living through the whole building, but then up on the roof we made a conscious decision to not just give the rooftops to the penthouse purchases who have the additional wealth to acquire the best part of the building. We said let's give the penthouse experience to absolutely everyone within the building. So if you've got a one bedroom on level two, or you've got a three bedroom on level 22, everyone has the ability to go up to the rooftop and have a genuine penthouse experience. And up there, we're not just doing a couple of sun lounges and a barbecue, we are building ... It's literally Disneyland, you're getting rooftop pools, you're getting private cinema rooms, you're getting private dining rooms, so if you're having a dinner party, you can book out the private dining room a hundred meters in the air and have a penthouse experience with 18 people. So it's really flipped what apartment living is on it's head and put [inaudible 00:09:43] good lifestyle. That's one thing that really impressed me I guess, [inaudible 00:09:48], as you said there are rooftop [inaudible 00:09:51], it's just another level. If anyone hasn't seen it, go online, have a look at it, it's ... As you said, Disneyland? It's an amazing backdrop. It's a big space, it's a huge space. I think it's a really gutsy move from the developer because ... To [inaudible 00:10:36], going and putting all that kind of, investment in a thousand square meters, sometimes hasn't paid off for people. But it's something I guess, you really believe in and you put your money in your mouth and you've backed it and I guess you're getting the results. Yeah exactly, it's a you know, I think an [inaudible 00:10:50] sterling, like it's a genuine six or seven million dollar investment, so you're sort of foregoing the revenue from the penthouse on that level and you're investing in something for everyone in the building and I think that's been the success to Aria resales and I've placed and obviously managed a few of those resales. But that's the reason we're seeing great capital growth in this market when a lot of other projects in the city of Brisbane haven't been performing that well. And that's one of the points I picked up on if you look at a lot of the press over the last couple of years, they've been particularly harsh on the Brisbane and all the part [inaudible 00:11:27]. An example is, only a couple of weeks ago, we reached the stand here in South Brisbane, was it 250 odd apartments you sold out in what, less than a month? Yeah, yeah, I mean we had an incredible result. Yeah, a lot of the apartment types were sort of pretty heavily under subscribed and yeah, you know, we up to 250 sales in the building and you know, it's just been a ... Yeah, it's been incredibly fulfilling, something I'm very proud of. But it's really been something we've built up over the last 15 years I think, and it's been our last 15 or 20 projects that are really culminated to being able to do that now in this market. We've built up a lot of trust with the off the plan under occupier and off the plan investor who is prepared to Aria to continue to deliver. Grew up just in the city here, in the display, before the [inaudible 00:12:23] but it's amazing the zillions it's gone up and [inaudible 00:12:26] again. So I guess that's ... And it's to be able to stick to your plan, ticking off anything else in the process ... and be confident in your product and we'd go and deliver what you had, you get success plus the [inaudible 00:12:39]. Yeah it is, it is, and I think with the standard, we sort of knew we wanted to raise the bar and raise the standard, part of the fun, but that's why we called it the standard because it is a new standard for us as a company at Aria and we're doing things here where it's building the path it's own residents only day spa within the building, will have it's own residents only rooftop wine bar with an in house Aria [inaudible 00:13:06]. So you can go up there and have a glass of wine of an evening. Even trying to get away from the reliance of a car and automobile where providing a few complimentary Teslas for everyone in the building to be able to utilize, so it's really ... Yeah, it's really providing I guess, even from an off seen sterling, it's gonna be whole new standard in terms of what were gonna bring this one. So you're excited to see what's gonna come next. Well surely you've got something cooking away there. In Australia, sorry, we wanna genuinely create the best buildings in the world with what we're doing. Fantastic, you're bringing it back to Brisbane. Obviously you've got a lot of history here in South Brisbane, [inaudible 00:14:27] in Brisbane. It looks like Sunshine Coast have been evolving. What do you look for in an area? When you decide to say, "Okay, let's go with this.". What are the key things? I think it's 450 or 500 restaurants and the lifestyle offering's within walking distance of you, so I think that's an important thing. And then just looking at where and what precincts are on the move and when you think of Woolloongabba and South Brisbane and these areas, you've got cross river rail, you've got Brisbane Metro, and you've got a new 3 or $4 billion casino and you've got Orion's and W hotels and you've just got all of this incredible infrastructure and I think you just think long term Brisbane. You look at what parts Sydney and Melbourne have done with that level of infrastructure, I think it's really exciting for the long term future for this sort of area around Woolloongabba into South Brisbane. It's gonna experience enormous change over the next three to five years. It will. And maybe just a bit of advice, I mean, over the past three or four years, there's been a huge amount of properties being sold off the premier parts of Brisbane and some people have great experiences, some people have come back and are really disappointed I guess with what they've got. What would be your, I guess advice, to someone if you're purchasing off the plan, what are the I guess, things to look out for [inaudible 00:16:12]? Look, I think the best thing you can do because buying off the plan is such a trusting experience, I think everyone's retinas look the same. Everyone shows a beautiful pool and a beautiful shot and a beautiful living area. I think the best thing you can do is ask the developer to show you three or four or five of their recently completed projects and actually drive it and walk through it and experience it, touch it and feel it 'cause it is quite easy to make marketing agreements look quite good. There's certain places that do that very well, but it's another thing to actually execute and deliver. So I think looking at product the developers produced is a really, really important test and then I'd just be focused on buying in those areas that are gonna have a genuine lifestyle change over the medium to long term 'cause I do believe those areas in the city of Brisbane, like it happened in Sydney and Melbourne, are gonna outperform a lot of the other inner city parts of Brisbane. I guess from a demographics point of view, what do you see happening with this with [inaudible 00:17:19] 10, 15 years with population growth, et cetera and how will you look to, I guess, address that market? For our lifestyle and our beaches. There's also, you gotta pair that with employment opportunities. Back in the mid to late 2000s, that seems to be ticking over again. Yeah, tourism's really, obviously a big driver, especially being on the doorstep of Asia. We give out the Gold Coast and Sunshine Coast and the casino about both, I think that's gonna bring an addition, another million plus tourists every year to Brisbane. So I think there's gonna be a lot of jobs created through resources picking up and obviously construction's been really strong, but tourism's gonna be a big driver as well. Agriculture's a big driver. So it's a lot of things to really like about where the job market is positioned as well, on the back of that staggering prove differential in Sydney and Melbourne. So I guess ... This is some of your feelings that despite some of [inaudible 00:19:04] that people pay, the apartment market, is your feeling really positively about [inaudible 00:19:08]. And I guess the takeaway is gotta really look at the product you buy. Apartments is apartments and it's living a lifestyle and the quality of things with it. And I think the biggest decision when they're buying off the plan, they have to ask themself, even if it's an investment, they've gotta say, "Would I live in this apartment?". And if it's not something they would wanna live in and they would wanna call their home for themself and their partner and their kids or if their single or whatever, then you should not be buying it because you're limiting your resale in 10, 20, 30 years purely to the investor market and that's what we've seen, Damian. Where you get real capital growth is if you buy it as an investor, but you go and sell it as ... To an unoccupied [inaudible 00:19:52]. That really is fantastic advice. Thanks, Tim. I really appreciate you taking the time here today to have a chat to us. And look forward to catch up again soon.